About Gangaur : Gangaur is a festival celebrated in the Indian state of Rajasthan and some parts of Gujarat, West Bengal and Madhya Pradesh. 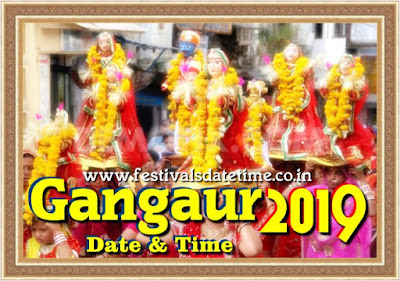 Gangaur is colourful and one of the most important festivals of people of Rajasthan and is observed throughout the state with great fervour and devotion by womenfolk who worship Gauri, the consort of Lord Shiva during March–April. It is the celebration of spring, harvest and marital fidelity. Gana is a synonym for Lord Shiva and Gaur which stands for Gauri or Parvati who symbolizes Saubhagya (marital bliss). The unmarried women worship her for being blessed with a good husband, while married women do so for the welfare, health and long life of their husbands and for a happy married life. People from Rajasthan when migrated to Kolkata in West Bengal started celebrating Gangaur. This celebration is now more than 100 years old in Kolkata.